If You Are So Smart, Why Ain't You Rich? If You’re So Smart, Why Ain’t You Rich? is first and foremost an exhibition project ( 27th febr – 31th march 2014) that pays tribute to the artist Julius Eastman, a genius Afro-American minimal composer who did not shy away from art as a medium of political expression, and secondly a project that questions through artistic reflection the place and confluence of knowledge and economics within society in general. For this project, we invited eleven international artists working primarily with sound and installations and whose works can be seen within the framework of artistic research to reflect and position themselves within «Knowledge Societies». This project explores also how sound becomes haptic, tactile and textual in society, politics and economics and more especially in the framework of the arts. If I contribute to this campaign, what will my money fund? If succesful, this WE MAKE IT campaign will fund the production costs of this exhibition. The artists are making new works and we need to rent also technical equipment for the presentation of the artworks and the planned workshops with the students of the art academy will require materials to purchase and rent. Additionaly we want to make a publication with all of the research results, text contributions by prolific writers that explore the topic, and documentation of the artists works. We believe in the power of the crowd. You as part of the crowd will enable us to make this project happen. We are interested to dialogue through different cultures through art and want you to be part of this. We need your help to cover our costs so that more art exchange is possible, also to less art saturated places in the world. 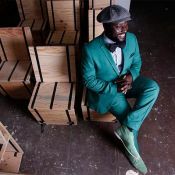 Bonaventure Soh Bejeng Ndikung (PhD), born 1977 in Cameroon, is an independent art curator and biotechnologist. He has been living on and off in Berlin since 1997, where he studied Food Biotechnology in the University of Technology Berlin, did a doctorate in Medical Biotechnology in Düsseldorf and a post-doctorate in Biophysics in Montpellier. He currently works, parallel to his activities as a curator, as a scientist in a medical device company. He is the founder and art director of the art space SAVVY Contemporary Berlin, where he has directed and curated exhibitions with more than 60 artists from 5 continents. He has worked as independent curator, art director or advisor for several international exhibition projects or festivals in Germany, France, England and Cameroon and has published more than 20 exhibition catalogues. Pauline Doutreluingne, born in 1982 in Belgium, is an independent art curator, visual researcher and Sinologist based in Berlin. She studied Sinology at Ghent University and focused her master thesis on experimental Chinese art and post-Orientalism. She went to Beijing in 2004 to do a master in art criticism at the Central Academy of Fine Arts. She was the founder of the Borderline Moving Images Festival in Beijing and assistant director at Platform China Contemporary Art Institute. In 2007 she moved back to Europe and installed herself in Berlin where she continues curatorial contributions to internation exhibitions, museum catalogues (FRAC NPDC), art magazines and film screenings. In 2009, she cofounded the artistic collective mindpirates, and undertook the visual research for the film Problema. Within mindpirates she intiated the Mindpirates Projektraum where she curated many exhibitions and projects, published publications and build a strong network of artists and audience around the mindpirates. This is the third large curatorial collaboration between Bonaventure Ndikung and Pauline Doutreluingne. Previously they co-curated the group exhibitions Settled Nomads – Nomadic Settlers in Kunstraum Bethanien, Berlin and Positioning Osmotic Impulses in the former Prison Neukölln –Berlin. Additionaly Anneli von Klitzing and Gauthier Lesturgie join the project as curatorial assistants. This project ended successfully on 7/2/2014 14:00! You receive a personal postcard from Marrakech. You will receive a specially designed *If you Are So Smart, Why Aint You Rich? * bag. You receive a Savvy contemporary bag and a personal vernissage invitation to our exhibition by postal mail. Yes, you receive a signed publication. You receive a signed copy of the publication and your name will be featured, (size of font 10pt) in the sponsorship area of the publication. You receive an entrance ticket for the Marrakech Biennale with an aperitive at the opening of our exhibition where you can meet the artists and curators. You are invited to dinner by the curators in the context of the exhibition and receive a signed copy of the publication. Your name will be featured, (size of font 11pt) in the sponsorship area of the publication. 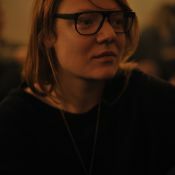 Pauline Doutreluingne is a Belgian independent art curator and visual researcher based in Berlin. Bonaventure Soh Bejeng Ndikung (PhD) is an independent art curator and biotechnologist. He is the founder and art director of the art space SAVVY Contemporary Berlin, where he has directed and curated exhibits with more than 60 artists from 5 continents.